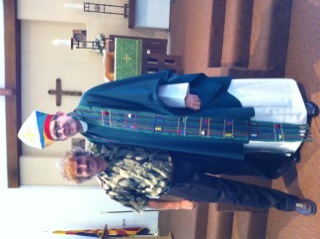 Today I had the great pleasure of being at St. Paul’s Church, a Sudanese congregation in Phoenix, Arizona. Bishop Nathan D. Baxter preached. I am posting his sermon is below. I hope you enjoy it and feel challenged by it as much as I did. There is much discussion in American Protestantism these days about the “Emerging Church.” There are major conferences & workshops, statistical research and much media attention. Our own Episcopal Church (including my diocese) keeps speakers like Diana Butler Bass, Phyllis Tickle and Brian McLaren quite busy helping us to understand this “new conversation with the culture,” as on bishop has put it. This all comes at a time when Western Christianity, especially mainline Protestanism, is in a very vulnerable state of decline in numbers, appeal and resources. Many see this movement as a kind of revival, a renewal of main-line middle-class Christianity. We hope it may be a way to recapture our sociological significance and statistical dignity; to recapture our younger communities, including our children and grand children and those of the communities with which we most identify. We also see the Emerging Church movement as away to recapture our existential meaning…to find reassurance that God may have purpose for us and our institution in a vastly changing world. As we are seeing other religious movements and varieties, evangelicals, independence, and growing secularism, we ask not just the church, but our selves, are we become extinct, irrelevant, antiquated. But the Emerging Church—ways to understand the psychology and spirituality of newer generations—as a way we might adapt and appeal as more than a politically conscience aging community with elegant but antiquated ways of worshipping. I must admit that we are finding some benefits from our openness to these developing phenomena, this emerging Church dynamic. It is helping us to ask hard questions, to recognize that there is great spiritual hunger being expressed in the world around us, including our children, grandchildren and our neighbors. That the needs being expressed are not just economic, social or political but a real hunger for engagement with God. We are find the will to consider how our congregations might make changes which could make us more responsive and welcoming to our own and our neighbors. As Brian McLaren stresses, the Holy Spirit is moving in our times and the Gospel of Jesus Christ is more relevant that ever before, if we are open to the Spirit’s guidance. McLaren’s distinct evangelical view of the Emerging Church presses us to see not just the sociological and cultural dynamic but to look through the lens of faith…..What is God doing???? What ways might God be reviving and changing the Church to serve and witness in these times??? Archbishop Tutu has said that sometimes “God has to shake a Church too satisfied with itself by the scruff of the neck; so that it see what God wants it to see and be.” Liberation theologians have taught us to use, what they call the “hermeneutic of suspicion.” To ask, what and who are we missing when claiming God is working. I believe that with all the enthusiasm about the Emerging Church in America we are missing a special gift of the Spirit…THE IMMIGRATION CHURCH!! If we look at the Emerging Church movement its face is young, white and culturally middle-class. Non-whites are invisible in the conferences leadership, icons and publicized literature about the movement. One could think that this movement of the Holy Spirit is about saving white western middle-class cultural Christianity; not about a radical movement of God the Holy Spirit rebuilding the Church of Jesus Christ for a new age. Earlier immigration movements which were European and were Christians from a Christian country shaped in a Christian culture…Catholic or Protestant. For example the Roman Catholic Church grew from Irish, Italian and Polish immigration; Lutheran churches from German, Norwegian and Scandinavian immigrants. They brought different languages and customs, but increasingly gave strength and new liveliness to their churches and mission. Most contemporary immigrants are yellow, brown and black. Many, while Christian, come from societies which are non-Western, often Muslim, Buddhist, Hindu or indigenous. The customs and culture of daily African life are very non-European or Middle American. The ways of worship and the sounds of music are often exotically different but richly spiritual. The stories of faith are far different than our stories; the challenges, fears and passion for a new, safe life are as exotic as their music to us. Yet, they tell a story of faith, of God’s miraculous working in human realities, witnesses which can revive the faith of the Church if we receive it. Our Presiding Bishop and the Episcopal Church are growing in its commitment to receive all the gifts of the immigrant church. Your bishops gathered here in Phoenix have been spent days listening to the story of Mexican immigrants. But the stories we have heard have not been only about the gross injustices of immigration laws and the racism they endure; nor just about the dangerous journeys to cross the borders. No, it has been even more…we have heard their stories of faith. How faith in God has brought them through unimaginable peril, how they have found hope and hospitality in many Episcopal Churches; and how we can reach out to both help our immigrant neighbor and receive the great powerful gifts of faith they offer us. Now while so much attention is focused on Latinos, I want you to know that the Episcopal Church has not forgotten about you…your presences here in America and the struggle of the Church in the Sudan. Our Presiding Bishop Katharine Jefferts Schori has called The Episcopal Church to a Season of Prayer for the Sudan. She said in her Sept. 15 letter that the Episcopal Church can stand in solidarity “with our brothers and sisters in Sudan as we enter a season of preparation by prayer, study, and action.” She went on to say, “I want to challenge us as a church to pray for the people of Sudan, to learn more about the forces driving the violence, and to advocate for a peaceful referendum, and whatever the outcome, a peaceful future…” She recognizes the extraordinary courage and leadership of the Church in the Sudan, saying “The Episcopal Church of the Sudan…has been a leader in seeing basic human rights, including religious freedom, as well as the hard work of peacemaking.” St. Paul’s, The Episcopal Church has not forgotten about you!!!! As the Presiding Bishop has made clear, we recognize the critical political and economical challenges before your brothers and sisters at home. As we work with you we will learn from you how we can prayerfully support. But we also welcome your great gifts of faith and worship into the American Church. The power of the Gospel in your experiences of faith, coupled with ours can bring revival in our congregations and our communities. Your differences can be a great gift to us if we can receive them. That you exist as a congregation in the Diocese of Arizona is a witness that we want and need you in our life. In my diocese (Central Pennsylvania) we have some of the Lost Boys. As I learn of their story, it inspires my faith. In famine, war, religious and political oppression the stories of faith amaze and challenge my all too comfortable faith. One of the Lost Boys studying at a University in my diocese reminded us of the words of a brother Lost Boy, John Bul Dau. Jon Bul Dau words are the title of the powers 2006 movie, God Grew Tired of Us. The Presiding Bishop’s Officer for Black Ministries, Canon Angela Ifill, has a new initiative to engage Sudanese congregations. My Diocese of Central Pennsylvania is starting a mission congregation among Sudanese in the Harrisburg area. The Diocese of Long Island is bringing my friend, Bishop Bernard of the Diocese of Torit in the Sudan, to plan a new Partnership. The Union of Black Episcopalians has established a seat on their National Board for leadership from Episcopal Sudanese Communities. The UBE’s new strategic plan is that together with all of Episcopalians of the African Diaspora will share together in ministry growth, building the mission of all our congregations, and become strong parts of God’s witness in and through The Episcopal Church. Remember, you have something to give. You are not here by accident. You are part of God’s Emerging Church in America. You, with all of the members of the new immigrant communities of faith are part of the Holy Spirit’s work in our time. Your story is part of God’s message of redeeming love and hope. Your ministry is part of the Holy Spirit’s revival of the Church. Your mission of faith and reconciliation is part of God’s mission here and at home. And what is that mission?? Well, you know what it is…..it is John 3:16. So please say it with me: “For God so loved the world, that he gave his only begotten Son, that whosoever believeth in him should not perish, but have everlasting life.” To this I say, Amen and Amen! Thanks Brian – this is so hopeful and energizing.